Full spectrum lighting plays an integral part in the health of your birds. If your bird does not live outside, or receive daily natural sunshine year-round outdoors, full spectrum lighting is a necessity for your bird. International customers: Please note that this light requires a 220V Converter. This converter must also be used when purchasing the full spectrum light bulbs. One of the greatest benefits of full spectrum lighting is the natural synthesis of Vitamin D precursors allowing the animal to naturally regulate calcium uptake. Another important benefit of full spectrum lighting is the effect it has on the glandular system; the Thyroid Gland controls how and when the other glands function and for it to function properly, it needs to be stimulated by normal photoperiods of full spectrum light. The Hypothalamus is involved in proper feather development and skin. The Pineal Gland controls the cyclical process such as molting and the reproductive cycle. Birds have four color vision and the lower wavelength (UVA) adds the fourth visual perspective. Correct spectrum and photoperiod of light are also critical factors in normal preening as well as the skin and feather health of birds. If a bird's system is not stimulated through adequate environmental lighting to maintain proper endocrine function, it may become lethargic and not continue normal preening behaviors. A full spectrum bulb with a CRI (color rendering index) of 90 or higher contains enough UVA to achieve this. It is middle untraviolet light (UVB) that causes Vitamin synthesis in the skin. Most professionals agree that the UVB needs to be somewhere between 290 and 310 nanometers in wavelength and a color temperature of 5000 Kelvin for this to occur. This item is for the Capitol Universal Light and the Capitol Swag Light that has one socket. The conversion kit changes the light to two sockets so that you can use our new full spectrum LED 5500k daylight bulb and the LED UV bulb. The set includes a "Y" connector that will fit the LED daylight bulb on one side and the LED UV bulb on the other side. Included: State of the art LED 6 watt/5500k daylight bulb and the LED 1.5 watt low dose UVA bulb. Measurement for the "Y" adapter with the 2 bulbs is 5 1/2 inches wide and 4 3/4 inches in length. Please note: You must use both bulbs TOGETHER for proper Full Spectrum/UVA lighting to allow absorption of Vitamin D3 by your bird. FeatherBrite moonlight bulb helps relieve the stress of night for those birds who experience "Night Fright". The bulb has 3 blue LED bulbs encased in frosted white globe. Candelabra base. Uses only .06 watts of electricity. One year warranty. NEW AND IMPROVED! Available in white, black, sand and silver. Every day is a sunny day with Featherbrite Full Spectrum Lighting! 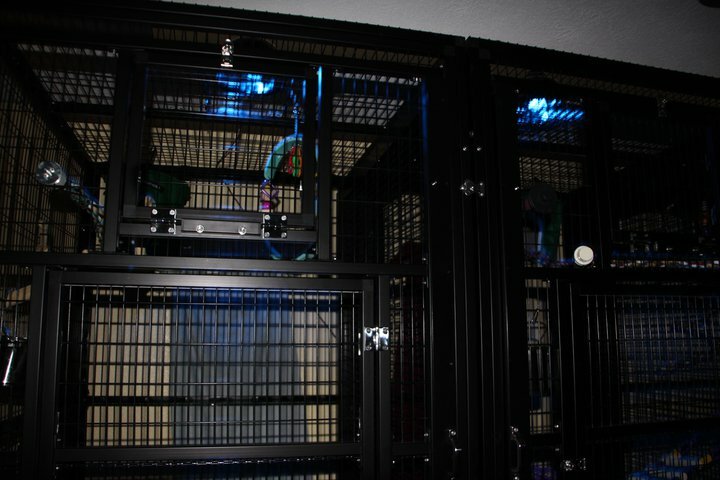 The FeatherBrite Full Spectrum Light fits most cages. Lightweight and easy to assemble. Units are 10" square and 10" high. 8 ft. electrical cord. Five non-toxic powder coat colors to choose from! A full spectrum bulb is included. Please click the photo for additional pictures showing colors. Every Day is a Sunny Day, Every Night is a Moonlit Night with FeatherBrite Full Spectrum Dayight/Moonlight Lighting for your Pet Bird. Two lights in one, day and night! This light is great for those pet birds that experience "night fright". The LED blue moonlight provides a calming atmosphere. The FeatherBrite Full Spectrum Light fits most cages. Lightweight and easy to assemble. Units are 10" square and 10" high. 8 ft. electrical cord. Five non-toxic powder coat colors to choose from! A full spectrum bulb is included. 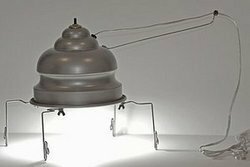 *Patented Design Moonlight Bulb also included! Available in white, black, champagne (light silver) and hammered steel. Please click the photo for additional pictures showing colors. Available in white, champagne (light silver) and hammered steel. Every day is a sunny day with Featherbrite Full Spectrum Lighting! This is a great way to provide your birds with healthy full spectrum light. Our swag light has a durable non-toxic powder coat finish. Chain is 12 feet with off/on switch on cord. Comes with a full spectrum bulb and hanging kit. Shade is 8 inches high and 10 inches wide.. Available in white, black, sand, champagne (light silver) and hammered steel. Every day is a sunny day with Featherbrite Full Spectrum Lighting!